East Haven is a town in New Haven County, Connecticut, in the United States. As of the 2010 census, the town population was 29,257. Located 3 miles (5 km) east of New Haven, it is part of the Greater New Haven area. East Haven is 35 miles (56 km) from Hartford, 82 miles (132 km) from N.Y. City, 99 miles (159 km) from Providence, Rhode Island, and 140 miles (230 km) from Boston. This area was long settled by indigenous peoples. Long before European encounter, Algonquian peoples occupied settlements along the coastline and rivers. The area now known as East Haven was obtained by Puritan settlers Reverend John Davenport and Theophilus Eaton on November 29, 1638, as part of the purchase of New Haven from Sachem Momauguin of the local Quinnipiack tribe. Additional land, in what is now known as Foxon, was purchased from Chief Montowese on December 11, 1638. In 1639 Thomas Gregson petitioned for the purchase of Solitary Cove, later called Morris Cove. This was granted on August 5, 1644, and was the last piece of land that made up the original town of East Haven. The original town boundaries were from the harbor and Quinnipiac River on the west to the Branford and North Branford town line on the east. The southern boundary is Long Island Sound, and the North Haven town line is the northern boundary. East Farms, as it was first called, was considered a parish of the New Haven Colony. Settlers settled into Morris Cove and what is now the "center" of East Haven in 1639. The first Connecticut ironworks, the third in New England, was founded on the shores of Furnace Pond in 1655. 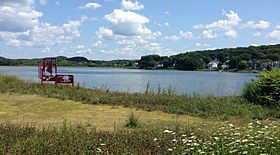 Called Lonotononket (Great Pond) by the Quinnipiac, it was renamed by English-speaking settlers as Lake Saltonstall. With Branford and North Branford having had settlers since 1643, people from the New Haven Colony started to settle the Foxon section in 1683. In 1665, the New Haven Colony was merged with the Connecticut Colony (Hartford) under a charter from King Charles II. With the success of the ironwork mill, the area became known as Iron Works Village. In 1675 Iron Works Village petitioned the Connecticut Colony to become a separate Town. Negotiations with New Haven regarding land never succeeded. This eventually led to the relinquishing of village privileges in 1685. Efforts were again made in 1703. The Connecticut Colony granted the town petition for Township in May 1707 and colonists changed the name from Iron Works Village to East Haven. Some outstanding land issues with New Haven and a minor feud with Governor Gurdon Saltonstall resulted in the rescinding of the township status; the area was made a parish of New Haven. 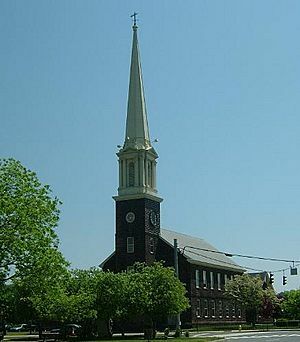 Jacob Hemingway, one of the first Yale students, served as the first pastor (1704–1754) of the Congregational church in East Haven. Several meeting houses were built over the years. In January 1772 the Society of East Haven authorized the expense of $1,000 to build a new 65-by-50-foot (20 by 15 m) meeting house. while under construction, the building was extended by 8 feet (2.4 m) and a steeple was added. In 1774 the Old Stone (Congregational) Church was finished, and Nicholas Street was named its first minister. During the American Revolution, this area was subject to troop movement and encampment by both revolutionary and British forces. 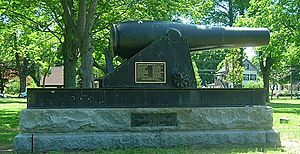 On July 5, 1779, British forces led by General William Tryon landed from war ships, attacked Black Rock Fort in Morris Cove and captured its 19 defenders. The British attacked New Haven and East Haven. General Lafayette and revolutionary forces also visited town and encamped on the green. During the Revolution, East Haven lost 16 men. John Howe was killed at the Black Rock Fort. Fifteen other men died, mostly of disease while held on British prison ships in Long Island Sound. After the war, the United States military abandoned Black Rock Fort. East Haven became an incorporated town of the new republic in May 1785. At the initial town meeting, on July 5, 1785, Isaac Chidsey was named first selectman. When relations between the United States and Britain deteriorated in the early 19th century preceding the War of 1812, the government decided to re-fortify Black Rock Fort. A new masonry wall was built for fortification. Six guns were installed, and a new barracks for 50 men and a magazine were built. The fort was renamed Fort Nathan Hale, in honor of the Connecticut patriot. During the War of 1812, the fort successfully defended the area from several British raids. In 1863, during the Civil War, a new Fort Hale was built to defend against possible raids by the Confederate States. Built next to the ruins of the original fort, the fortification included an earthen rampart, five fortified bunkers, eighteen guns and a moat with a drawbridge. The fort did not see any action during the Civil War. East Haven lost 15 men during the war. Two men, Charles Benoit and James Murphy died at Andersonville prison in Georgia. East Haven's western border was the Quinnipiac River, and the town was in charge of four bridges that crossed it. In 1881 East Haven was facing a financial problem. The repair and maintenance of the four bridges that crossed the Quinnipiac River, along with highway maintenance, and payments to Civil War soldiers, presented the town with a $200,000 debt. The bridges contributed $180,000 of that debt. Combined with requests for additional town services, the Board of Selectman voted to sell Fair Haven, Granniss Corners, and Morris Cove to New Haven. After a public vote, in which East Haven residents voted 123 to sell and 9 against, it ceded those three sections to New Haven. The town cleared its debt, at the same time losing 70% of its population and 33% of its land area. The new East Haven continued to grow. In 1892, after several businesses and the town hall were destroyed in a fire, the Board of Selectmen voted to install fire hydrants in the center of town and ordered 500 feet (150 m) of hose. Fighting town fires was handled by citizen volunteers who came to the fire. By 1899, several young town members formed a volunteer fire department. They applied for state recognition and started serving the town on January 2, 1900. Policing East Haven was handled by New Haven sheriffs until 1900 or so when the town hired Jim Smith to be the town's first constable. Smith used the barn on his farm as the jail. The constable staff continued to grow until it was organized in 1925 under the Board of Public Safety. This included the East Haven Fire Department and the newly organized East Haven Police Department. Technology was improving the lives of the residents. In 1898 gas lights were installed in East Haven. By 1903, four streets were lighted by gas lights. The town established its own telephone company in 1899 and had 75 customers before selling its holding to the local telephone company. Electric lights made their debut in 1918. The East Haven Library was established in 1909. With an increase in population, especially Catholic immigrants and descendants of Irish and Italian ancestry, the first Roman Catholic church opened in East Haven in 1916. Five East Haven men died while serving in World War I. The town voted to build a new town hall in 1927. Built at a cost of $135,000, the new town hall was dedicated on August 11, 1928. More than 5,000 residents attended the open house. The next month, on September 22, 1928, the new East Haven Library was opened and dedicated. During World War II many men from East Haven served overseas. Twenty-four died in the war. After World War II, East Haven benefited from suburbanization, as families followed newly constructed highways and moved out of the older, dense cities into less settled areas. The GI Bill helped veterans buy the new houses built in outer areas. 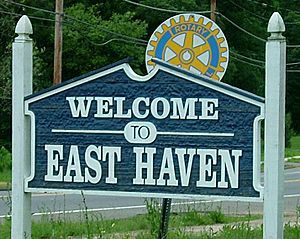 The population of East Haven nearly doubled from the end of the war to 1960. The population increase was also assisted by the building of Interstate 95 through the center of town in 1951. A less beneficial effect was drawing off retail business and dividing residential areas of town. During the Vietnam War, Lance Corporal Richard J. Wolcheski, USMC, was the only East Haven man killed. Following the highways, large retail stores and fast food franchises started to build outlets on both U.S. 1 and State Route 80 in the 1960s and 1970s. The downtown area was redeveloped in the 1970s with construction of the East Haven Mall to compete with suburban malls. Condominiums were built in the Center and Foxon sections. The town added its athletic complex, a new swimming pool to the high school. The new East Haven Police headquarters was finished in 1973. New Haven and neighboring towns such as East Haven have been destinations for a new wave of immigrants since the late 20th century, the majority of whom in East Haven are Latinos from Ecuador. In the 2010 census, Hispanics and Latinos made up more than 10% of the town's population. Following successful Main Street renovations in other older towns, since 2004, the downtown area has been revitalized to emphasize its historic attractions and scale, based on its tradition as a New England town. Period lighting was installed and brick sidewalks to emphasize pedestrian appeal. It has a weekly Farmers' Market held on Sunday at the Town Hall square. On March 16, 2009, the town came to an agreement with neighboring New Haven over the future of Tweed New Haven Regional Airport, which straddles the boundary between the two municipalities. This ended 40 years of competition. On August 9, 2013, a Rockwell International Turbo Commander 690B crashed on approach, hitting two houses in an East Haven residential neighborhood near the airport. The impact and the resulting fires destroyed both houses. The private plane had taken off from Teterboro Airport in New Jersey. The incident resulted in four deaths: the pilot of the plane; his passenger, the pilot's 17-year-old son; and two children in one of the houses. They were girls of 13 years and one year of age. The shape of East Haven on a map is taller than it is wide. It is bordered on the south by Long Island Sound, on the west by New Haven, on the north by North Haven, and on the east by Branford, Lake Saltonstall, and North Branford. East Haven shares with New Haven the land belonging to local Tweed New Haven Airport and Alling Memorial Golf Course. Dinosaurs were long ago succeeded by deer, coyotes, squirrels, foxes, chipmunks and rabbits. Garter snakes can be found in the area. Pheasants, grouse, ducks and wild turkeys can be found in East Haven, as well as cardinals, blue jays, warblers, crows, sparrows, parrots, woodpeckers and sea gulls. Trout can be found in the fresh water lakes. Bluefish, bass, flounder, blackfish, sand sharks, eels, lobsters, crabs and clams can be found in Long Island Sound. The area borders Branford and North Branford on the east, New Haven on the west to about Grannis Pond in the south, and surrounds State Route 80. This is the hilliest section of town. It counts among its landmarks the town high school, Foxon Park Beverage (a locally famous soda manufacturer), and Camp Murray, a Girl Scouts day camp. Grannis Pond used to host a YMCA camp until the land was sold and developed. The Center is not the geographical center of town but the hub of the administrative facilities. Landmarks include the Town Hall, Fire Department Headquarters, Hagaman Memorial Library, the "old" East Haven High School, and other administrative buildings. The old high school has been adapted for use by the East Haven Historical Society, and a teen center. The Police Department and Public Works Department reside on the "Center" - Foxon line. The Town Green is a 2.4-acre (9,700 m2) park located at the eastern end of the central business district (two blocks east of the town hall) and is mostly covered by trees. Monuments are dedicated to honor war veterans and firefighters. The focal point of the green is the gazebo or bandstand. The Green is the site of the annual East Haven Fall Festival and summer concerts. Margaret Tucker Park is considered the second East Haven Green, with its location across the street from Town Hall and the Old Stone Church. They have developed additional land to the park, along with a water fountain. Included in this section is the "West End", which borders New Haven. Since the late 20th century, conditions have declined in this area of older housing. Efforts are underway to revitalize the area that most residents think have been overlooked with all the focus of the re-development efforts in the center of town. The Senior Center is located one block from Town Hall. The town has a weekly Farmers' Market held at the Town Hall on Sundays. This market features fresh produce, flowers, baked goods and crafts. Some weeks feature fundraising for town institutions. East Haven's climate is tempered by its location on Long Island Sound; it has a continental climate which is common in New England. Winters are usually milder, with less snow accumulation, than those found inland. 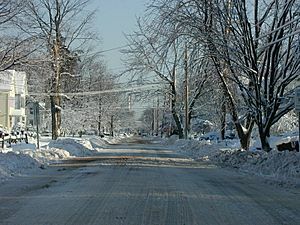 In a normal winter East Haven averages 27 inches (68.58 cm) of snowfall. It is not unusual to have a dusting of snow by the coast and an inch of snowfall in the northern areas of East Haven. The town is vulnerable to Nor'easter weather systems that can drop heavy rain or snow in the region. The Blizzard of 1888 dropped about 40 inches of snow, while the Blizzard of 1978 dropped almost 2 feet (0.61 m). Summers are moderately warm and humid, though cooler than inland. Though rare, the region does experience high [heat waves] and some 100 °F (38 °C) days. Precipitation is evenly spread throughout the year. East Haven enjoys a fairly long growing season with the last frost occurring in mid April and the first frost occurring in mid October. On average, East Haven has 207 sunny days and 158 cloud or rainy days. Severe weather does occur in East Haven. The area has been hit by several hurricanes, most recently in August 2011 when Hurricane Irene severely damaged numerous shore areas, destroying houses along Cosey Beach. In 1985, the eye of Hurricane Gloria came across state 22 west of East Haven. The area was without electricity, telephone and cable TV service for 7 days. Tornadoes sometimes occur in Connecticut. Though the town was not directly affected, a tornado touched down in Hamden on July 10, 1989, 7 miles (11 km) away. On August 11, 2016 a tornado touched down in North Haven, 5 miles (8.0 km) away. 44% of the adult population (25 years and old) possess a high school diploma, 6% have associate degrees, and 19% have bachelor's degree or higher. Quinnipiac River in East Haven, 1907]] According to the United States Census Bureau, the town has a total area of 39.9 square miles (103.3 km²), of which 39.0 square miles (101.1 km²) is land and 0.9 square miles (2.2 km²), or 2.16%, is water. East Haven, Connecticut Facts for Kids. Kiddle Encyclopedia.